Why lavender eye pillows might be the answer to your health and happiness! There are a number of reasons why a simple lavender eye pillow could be just the thing you need to help you feel less anxious or stressed and more relaxed and happy. Lavender eye pillows are sometimes also referred to as ‘dream pillows’ or ‘comfort pillows’. These names speak for themselves and maybe better describe the benefits of these amazing little items: from promoting good sleep, to relieving eye strain, soothing headaches and more! Life is often quite stressful and a hectic schedule can leave you feeling stressed right up until bedtime. This can make it difficult to fall asleep or stay in a deep rejuvenating sleep… and a good night’s sleep is essential for a fresh, clear mind that can help you cope with the stresses of the upcoming day! 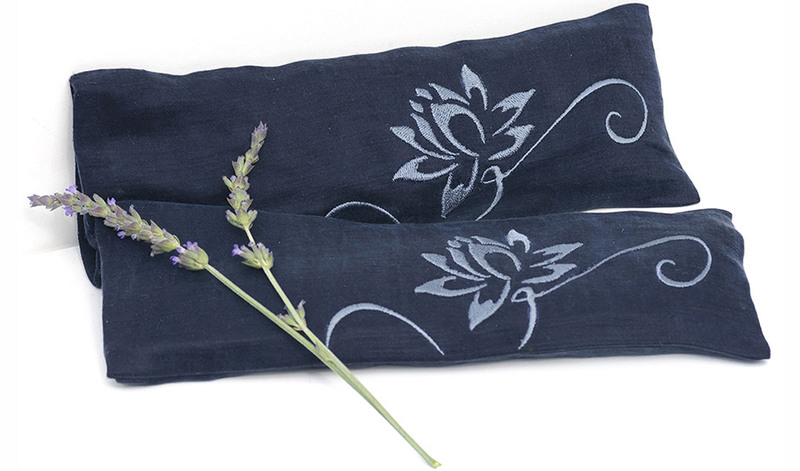 What you need is a way to calm your mind and a lavender eye pillow will do just that. When you place the pillow over your eyes, it perfectly blocks out light, cutting out stimuli to help calm you as well as relieving any eye strain. This is especially beneficial if you work at a computer all day. Our lavender eye pillows are filled with dried lavender and flax seeds. Simply massaging your pillow will release the scent or you could add an extra drop of essential oil if you prefer. The fresh lavender scent has a therapeutic affect that is proven to reduce anxiety and induce sound sleep. Lavender is also said to be a natural anti-depressant and can give relief from tension headaches. But that’s not all! The flax seeds allow the pillow to fit the contours of your face, but more importantly they provide a gentle pressure on your acupressure points. This helps relieve eye tension as well as promotes clarity and calmness. Light pressure on your eyeballs lowers your heart rate and stimulates the vagus nerve. This nerve is responsible for how our digestion affects our mood and stimulating this nerve helps us relax more deeply which done regularly can help us develop long term resilience to stress… ultimately leading to happiness! Wow, all this from a humble eye pillow! But don’t just use it at bedtime, use for a few minutes anytime you feel anxious or just need relief for your eyes. Refrigerating it for a while will also give you a more cooling, soothing effect. You can also use the pillow at the end of your yoga session during the Savasana pose to obtain deeper relaxation, or while you meditate to help shut out the world and focus inward. Our lavender eye pillows are 100% natural and hand-made in Cape Town, South Africa. We use cotton for the pillow and a hemp/silk blend for the removable pillow case. Why hemp/ silk, you ask? Well, they are both natural fibres, so are breathable and together they tick all the boxes. Hemp is stronger than cotton, has anti-bacterial properties and is kinder to the environment as it is a sustainable crop requiring less water, energy and land than other crops. Silk contains a protein that contributes to skin health, calms the nervous system and has anti-ageing properties. All this and a luxurious feel! As a finishing touch, we added a beautiful lotus flower embroidery as it is a symbol of purity, tranquillity and detachment… everything we hope you will gain from using our lavender eye pillow.